Thanksgiving is finally just around the corner! It’s impossible not to look forward to spending time with loved ones + gathering around to watch the parades. That is, after all, what makes this season so special! 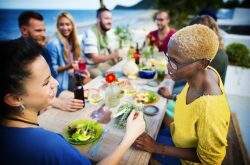 But, at the same time, many of us are also a little worried about navigating the lines of decadent desserts + not-so-healthy casseroles. Not to worry, you don’t have to give up your favorites for good! 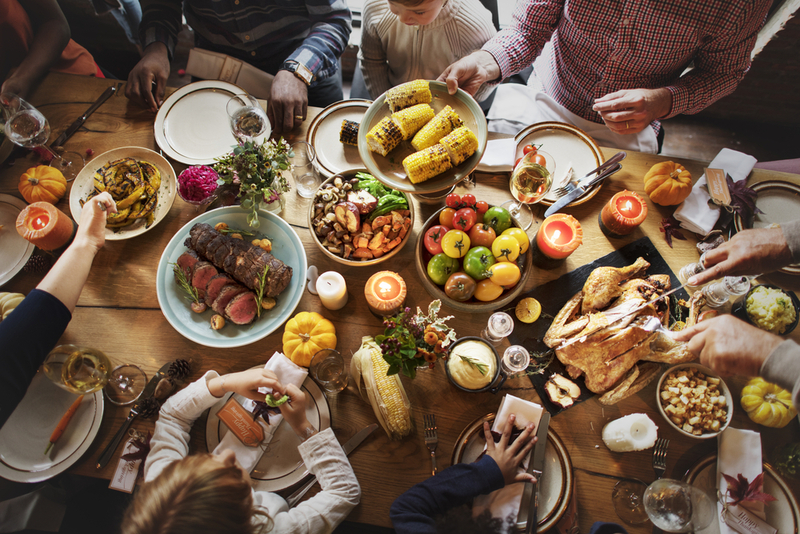 Be the host with the most with these dishes for a healthy Thanksgiving everyone will love! This recipe brings together a wide range of flavors and textures that complement one another in a way that is almost magical. For those who might be heading into the dining room worried about options for a vegetarian or plant-based diet, this healthy Thanksgiving dish is perfect for you to try! Position racks to sit on the upper + lower thirds of your oven, then preheat to 400°F. Cut crosswise into 1-inch slices. 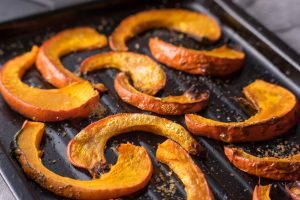 Toss squash slices and shallots with oil, ½ teaspoon salt + pepper in a large bowl. Roast for 30 to 40 minutes turning each piece over and rotating the pans top to bottom halfway through until the squash is tender. Transfer the squash and shallots to a serving platter. Combine honey, vinegar, and a pinch of salt in a small saucepan. Bring to a boil over high heat, then reduce heat to a lively simmer and cook for5 to 8 minutes or until reduced to about ½ cup. Immediately drizzle the syrup over the squash. Serve topped with pomegranate seeds, pine nuts, and mint. Your typical Thanksgiving stuffing packs a one-two punch of refined carbs and unhealthy fats on top of more sodium than you need for a week! 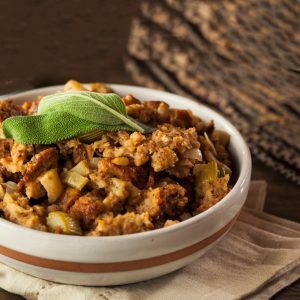 Upgrade your recipe with this Savory Sage Stuffing that offers 11 grams of protein without the refined carbs. In a large skillet or saucepan, melt the butter, then fry the onion until soft, about 10 minutes. Add all the remaining ingredients, and mix well. Transfer the mixture to a large bowl, and mix to combine. Weigh the turkey after stuffing to calculate the complete roasting time. Roast as directed on the package. Maintaining through the holidays doesn’t have to mean you can’t enjoy your holiday favorites! 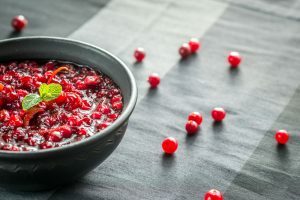 Try this low-gi recipe for cranberry sauce with a little twist. In a medium saucepan over medium heat, dissolve the erythritol in the orange juice. Stir in the cranberries, and cook until they start to pop (about 10 minutes). Remove from heat, and transfer to a bowl. Cranberry sauce will thicken as it cools. The big Turkey Day meal is the main focus, but what are you going to do with all of that turkey afterward? This recipe is a great way to refresh + reuse your turkey for phenomenal leftovers! See more below. 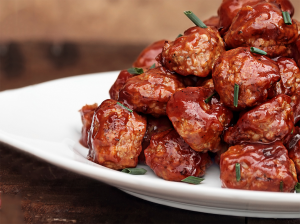 Combine all of meatball ingredients in a medium bowl. Form into 16 meatballs and place on a cookie sheet. Bake in a preheated 375 degree oven for 15 minutes or until cooked through. Combine cranberries, water, and sweetener in a small saucepan. Bring to a boil, lower the heat, and simmer for about 8 minutes or until the cranberries start to burst. Pour through fine strainer to remove skin and seeds. Return to the saucepan, whisk in xanthan gum. Add the meatballs and toss gently to coat in the sauce. 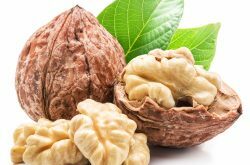 Often, it’s the snack and appetizer foods that cause us to go overboard on calories, fats, and carbs. 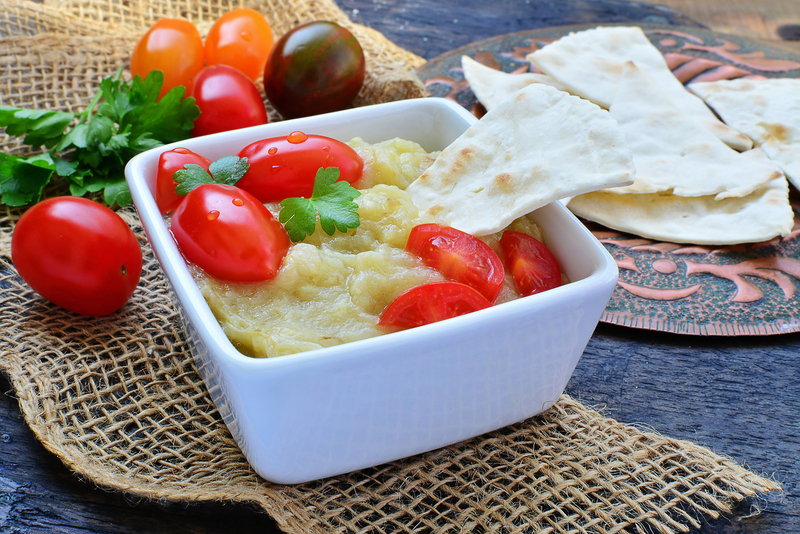 Creating a healthy and savory dip to go with fresh veggies is the best way to avoid filling up on unhealthy appetizers before the good stuff comes out! Even if you’re not a fan of eggplant, tossing in garlic and just a few other spices might just win you over! Slice eggplant and place on a greased baking sheet. Top with onion and garlic cloves. In a food processor, add eggplant and pulse until desired consistency. 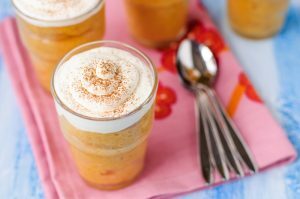 If dessert is one big slippery slope for you, this healthier option offers all of the flavors and texture of a pumpkin pie without all the calories and crust from a traditional recipe. It takes only seven ingredients to create this simple and delicious dessert. Your family will be lining up for this one even if they didn’t think they were a pumpkin lover! Spray 6 7 oz. ramekins or custard cups with olive oil cooking spray. In a large bowl or stand mixer mix together pumpkin, cream eggs, spices, and stevia. Pour evenly into 7 oz. ramekins. Invert onto a plate or serve from the dish. Snickerdoodle cookies are good, but what if you could take them up a notch without worrying about breaking the blood sugar bank? This gluten-free and homemade recipe is almost too good to be true, but it’s just another wonderful addition to a healthy Thanksgiving spread! Just be careful how hard press your thumb when creating the indent. Too much pressure and your whole batch will flatten when baking. Place everything except sea salt and vanilla extract in a 16 ounce or larger mason jar. Microwave 1 minute. Stir well. Microwave 1 more minute, don’t stir, let it sit for 2 minutes. Check the color and consistency. If it still looks too loose and thin, microwave 1 more minute. Stir in the seas salt and vanilla extract. Whisk the first six ingredients together in a bowl. Set aside. 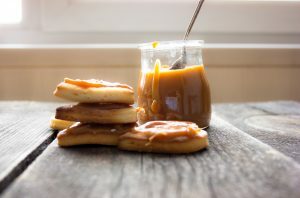 In a stand mixer add the remaining ingredients except for the optional Sukrin gold and salted caramel sauce. Blend well. Pour wet ingredients into the dry mixture, then blend again until combined. Place them on a parchment lined cookie sheet. Very carefully use your thumb or around 1/4 tsp measuring spoon to make a small indent in the center of each ball. Let cool completely then fill with caramel. Keep in fridge to set caramel or before ready to serve! What are your favorite Thanksgiving recipes? Tell us in the comments!